Buying a domain name will be your first acquisition in creating your website. Key points to consider are that your domain name should be easy for clients to remember, and it is best if it is directly related to your business or what you. DMuirDesigns.com recommends GoDaddy.com due to price, simplicity, and service. Skip all the extras that will be up-sold to you except, possibly the privacy option. As for email accounts, your hosting company (see Step 2) should include multiple email accounts, such as sales@domain-name.com info@domain-name.com, etc. For even more simplicity you may want to buy your domain name from your hosting company, although this is slightly more expensive and is usually not advised to have both your domain name and hosting from the same company. Next is to purchase a hosting plan where your website will be located. 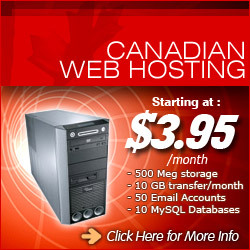 DMuirDesigns.com recommends HostGator.com or CanadianWebhosting.com if you are looking for a Canadian company. Both of these companies are reliable, fast, include C-Panel for ease of use, are WordPress friendly and have superior support. Type in the “Nameserver 1 & 2” which should of been emailed to you from your hosting company. If help is needed both GoDaddy and these hosting companies will be very useful. Plus, if you linked through this site and bought hosting, we make a small commission; therefore, if you need help send us a question in the comment section below. Installing WordPress is your next step. Why WordPress? First off, it is free, but better than that it is simple to use, an excellent Content Management System (CMS), great for Blogging, and has a tremendous support structure through the large community of users willing to help you. Plus, WordPress has a huge selection of free and premium (not free) themes and plugins to create whatever style and functions you are looking for. Follow the instructions for a new installation of WordPress. Install in Directory – will be left blank most likely unless you are setting up for a second Domain in the same hosting account. Administrator username – create a name that you must remember! Administrator password – create a good strong password that you must remember! Admin nickname – can be the same as the username but this is what shows in your blog. Admin email – this must be one you can access. Site name – usually your “Domain Name” – can be changed later. Description – not necessary but if you have several websites you might want to put some information here to remind you of who you made it for etc. When done it is good to fill in “Email the details of this installation to:” so you have a full record of the installation together with your login info. If you have any trouble with the setup, your hosting company should provide great help. If you type in your “Domain Name” into a browser like Explorer or Firefox you should now see your WordPress website with a default theme. Note: If you just set up your nameservers at GoDaddy it may take 30-60 minutes for the change to occur. You now need to log in to the backend or “Dashboard” of your website so you can personalize the theme to fit your business or organization and add content. To login to the Dashboard of your site you will need to add to your domain name in the browser “/wp-admin” such as “YourDomainName.com/wp-admin”. There are many themes available, some free and some you must pay for, known as premium themes. Under the Appearance section of your dashboard you will find free Themes where they can be searched for and loaded or you can checkout WordPress.org. If you are looking for a top quality theme or one you can be very creative with you will probably want to buy a premium theme or use a program to create your theme. DMuirDesigns recommends premium themes from IThemes.com and in particular the Builder Theme or Genesis Theme and their many child themes as they give you a lot of flexibility and support. If you wish to create your own theme we highly recommend Artisteer.com as you can easily design your own theme without using any code. Download the trial version to test it out; the test version puts watermarks on the site, but once licensed these disappear. Time to add your content; when it comes to websites “Content is King”, but even more important “Communication is King.” A great looking website will attract your target audience but they will not stay long if your content is out of date, or not applicable to their current needs. Giving your clients content that is up to date, applicable, and meeting their needs will pay advertising dividends as they are more likely to recommend your site to other potential clients. As well it should communicate with your potential clients in a way that will motivate them to take action. Time to backup your site. WordPress is made of 2 parts that need to be backed up so you never lose all your hard work. The first part is the theme, plugins, etc. and the second part is the database that contains all your content in the pages and posts. Not only do you want backups but you will want to go back in time to an older backup should you make a change and back it up only to find that the change was wrong and you want to go back to an earlier format.There are free backup plugins that at the beginning you may want to try such as WordPress Backup to Dropbox but DMuirDesigns.com highly recommends the plugin BackupBuddy as it is easier to use, can be set to automatically do regular backups of the full site or just the database (which tends to change most often). Also BackupBuddy allows you to send your backup files to AmazonS3, Dropbox, FTP or Email. Lastly should you need to do a restore from a backup, BackupBuddy walks you through the process. Get noticed. Socializing your site with links to Facebook, Twitter, Linkin, etc. can help your site get noticed. Adding a blogging section with regular, interesting, up to date information will help to get your site recognized for your expertise, plus search engines will tend to rate you higher. Leaving business cards, dropping off posters, exchanging links, and working with other businesses or organizations where you promote them and they likewise promote you is a great way to put you on the map. Plugins are available for almost everything to make your website do whatever you want. Under the plugin section you will be able to search and load what you are looking for. Askimet – This anti-spam plugin is already loaded but needs to be activated and the Askimet API key setup. SEO – There are several Search Engine Optimization plugins, search for one with good ratings and start using it to increase your search engine ratings. Google Analytics – This plugin will allow you to see how much traffic you are getting along with where they come from, what search engine they use plus a multitude of useful information. Sitemap Generator – This plugin makes it easier for search engines to read you site and therefore can increase your search engine ratings. Some also allow you to create the Robot.txt file that again can help SEO. Cache – Cache plugins can help speed up your website. For the contact form use the free Fast Secure Contact Form plugin or for a fully customizable form that is interactive there is nothing better than Gravity Forms. There are many helpful resources for WordPress on the Internet. WordPress.org itself is loaded with helpful information but you will also find many sources on Youtube.com and elsewhere. One place, in particular, for good tutorials to help you with creating your WordPress website that we recommend is iThemes Free WordPress Tutorials section. WordPress puts out updates on a fairly regular basis and so do all the plugin and theme creators, therefore, you need to update all of these. Fortunately, WordPress has a easy to use update center built in. Note: Before updating it is recommended that you backup your site just in case something doesn’t update properly. Don’t settle once your site is up and running, continue learning how to adjust your theme and plugins. Your website needs to stay current otherwise your business will seem out of date also. One place to increase your learning is at WebDesign.com which gives online web design video tutorials, forums and chat room. Good luck and if you have any questions you can comment below and we will get back to you ASAP. is it possible that i could use this information for my school project? please email me if this is possible.